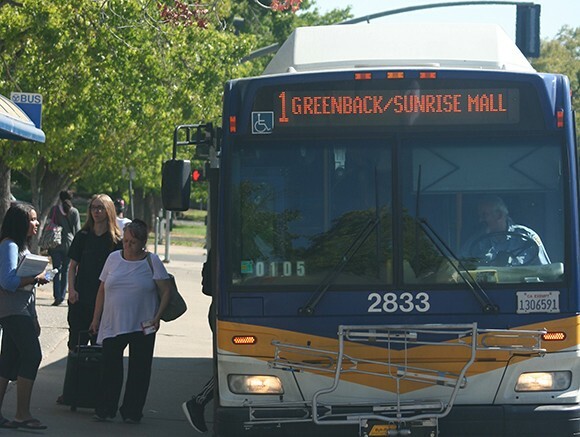 Voting to renew the universal transit pass (UTP) agreement between the Los Rios district and Sacramento Regional Transit (RT) on Eservices on Sept. 22 and 23 would benefit all students, whether they take the bus or drive. Measure A, which is up for a vote by all Los Rios students on eServices next Tuesday and Wednesday, would renew the contract until 2021. The controversy comes from how this measure is different than the current agreement. For example, if Measure A passes, students taking less than three units will not be eligible for a universal transit pass during the fall and spring semesters. Perhaps the most impactful change is that the fees for the UTP, which every student pays at registration, would double for some students. Currently, students pay between $5.54 and $16.62 a semester, or between $2.77 and $8.31 if they use the Board of Governors (BOG) fee waiver. With the passing of this measure this price would be increased to between $8.40 on the low end and $31.50 for students taking 15 units or more. These fees would no longer be covered by the BOG fee waiver. Certainly, it would be better from the perspective of the students if the fees weren’t increased and if all students could get a bus pass. Nevertheless, this is the choice we face. Either increased fees, or students have to pay the full price of a bus or light rail ride: $2.50 a ride. Even for the students who drive, who it seems at first glance would receive no benefit from increased fees, this measure is beneficial because it would bring money to the college to support programs and services. The college’s funding is based on enrollment. The school is given money by the state up until a certain level – the enrollment cap – is reached. If the school has two consecutive years where enrollment is below the cap, the cap is moved down to reflect that. American River College and Los Rios district enrollment are down this semester. Considering that Los Rios students accounted for 4.4 million RT boardings in the 2014 fiscal year, it is reasonable to say that RT is a major part in helping many students get to and from school. Without this essential lifeline, the amount of students enrolled would drop and affect the entirety of the school’s programs and funds. As disparate as our ARC community may seem at times, what we do as students affects everyone else. Whether it’s dropping a class after someone on the waitlist has given up on the one hand, or helping a fellow student find a classroom on the other, we can either make this school a worse or a better place to learn. As much as Measure A doesn’t fulfill everyone’s wish list, it is the best choice for us as a student body to make. Ashlynn Johnson is a second-semester student on the Current and co-editor of the Opinion section. She previously served as sports editor. Ashlynn is majoring in Biological Sciences and plans to transfer to the University of Washington. 1 Comment on "Opinion: Bus pass measure not perfect, but the best choice"
Measure A is unfair to students who do not use public transportation. I don’t even live in Sacramento and I am being forced against my will to pay so other people can ride the bus at a cheaper rate. How is this fair to me, when I still have to buy a parking permit and pay for gas to get to the college campus. So basically this measure forces students to be financially responsible for other students transportation. I feel Los Rios colleges should be ashamed for not advocating for a measure that benefits ALL students.